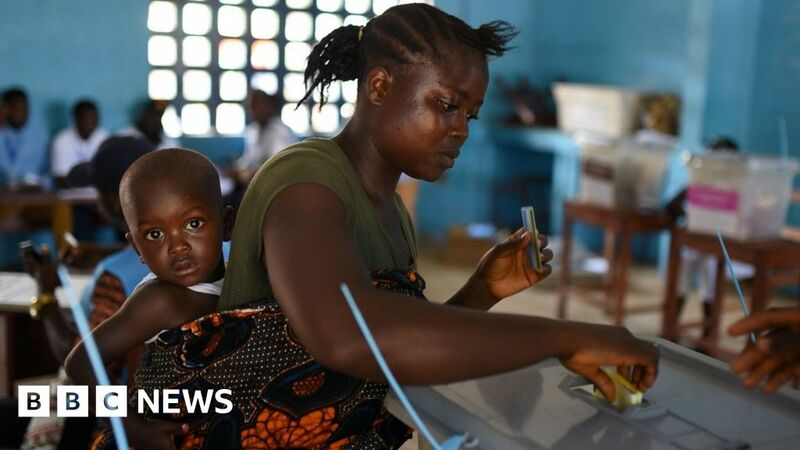 A former military coup leader has won the first round of Sierra Leone`s presidential election. Julius Maada Bio secured 43. 3% of the vote, short of the 55% he needed to avoid a second round run-off. He will now face the ruling party candidate, Samura Kamara, who was behind by just 0. Should Brig Bio win that contest, it will be the second time he has led Sierra Leone, having briefly headed a military junta in 1996. Brig Bio came to power after ousting Valentine Strasser - the soldier he had helped become Africa`s youngest leader in another coup just four years earlier. Three months later, he stood down in favour of the democratically elected Ahmad Tejan Kabbah. But he is not the only one with a strong a link to his short-lived military junta: Brig Bio chose his now rival Mr Kamara as his finance minister in 1996. More than two decades later, the two men have stood against each other, offering the country different visions of their future, fought on the platforms of corruption, the economy and the state of the country`s education and health. According to our reporter in Freetown, Mr Kamara is offering the country the option of "continuation" - arguing the current administration is making strides forward which need to be built on. Brig Bio, on the other hand, is the change candidate. There has been no reaction yet from the two men, but our reporter says he would not be surprised if the campaign buses were spotted making their way around the country today. Both candidates will also need to approach the men who came third and fourth, as their support will be crucial. However, that is likely to be tricky as they were both, at one time, members of the leading candidates` parties. One was expelled from the ruling party, while the other resigned from the main opposition.